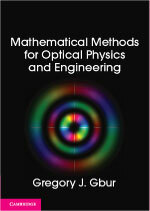 ← Physics demonstrations: cloaking device? A good demonstration of a physical phenomenon should be both insightful and exciting. Sometimes, a demonstration succeeds at both so well that it is practically awe-inspiring. Such is the case, for me, with the demonstration of Chladni patterns, exotic and beautiful vibration figures that can be displayed with the help of just a little sand. The demonstration of a couple of Chladni patterns are shown in the video below. A metal plate, supported by a post in its center, is vibrated at a single frequency by use of a mechanical driver. For most frequencies, nothing at all happens; when certain special frequencies are hit, however, standing waves appear on the plate, driving the sand away from the points of large vibration to the points of no vibration. By varying the frequency of oscillation, we can find a large number of the so-called resonance frequencies and their accompanying patterns, which become increasingly complex and beautiful as we up the rate of oscillation. Chladni figures are a lovely examples of resonance, an important concept in almost all branches of physics, including vibration. Rigid and semi-rigid bodies possess an (in principle) infinite number of natural frequencies of vibration at which the object “wants” to move. In this post we look at resonance, as illustrated by Chladni’s demonstration, and the role it plays in numerous phenomena. You likely took advantage of resonance at a very young age, though you likely didn’t know it! A child’s swing is in essence a pendulum, and has a natural frequency at which it likes to swing. To get the swing going, you pump your legs and arms in time with this natural frequency, allowing the motion to build up over each period of swing. In doing so, you are driving the swing at its resonance frequency. If you were to drive the swing at any other frequency, you would find that your motions tend to work against the swing as much as with it, resulting in very little motion. A pendulum or swing is the most simple example of a system that can be driven at resonance; most objects have multiple resonance frequencies, indeed an infinite number of them. The next example in order of complexity is a vibrating string which is fixed at both end, like those on a guitar or a clothesline. If we were to mechanically drive this string, we would find that it has a lowest (fundamental) frequency, which we will call f, and then higher-order frequencies (harmonics) at 2f, 3f, 4f, and on to infinity. The vibrations on the string (which we call modes) look different for each harmonic, as illustrated below. Strings of different lengths, thicknesses and tensions will have different fundamental frequencies, but they will all follow the same pattern: higher-order resonant frequencies will all be integer multiples of the fundamental. So what is the origin of this pattern? The picture above actually provides the answer, if you look at it carefully: The fundamental and harmonic modes are those for which one round trip of waves on the string is a single wavelength. A single cycle of a wave, the size of a wavelength, is one for which the wave has completed one complete up/down motion, as shown below. The fundamental mode in the picture above is only a half-wavelength; a full round trip of the wave back and forth across the string constitutes a complete wavelength. When we drive the string at one of these fundamental frequencies, we are always adding to the vibration of the string in the same way at the same point in the string’s cycle, much like a child on a swing always pumps it at the same point in the motion to move it higher. Looking again at the mode pictures above, it is to be noted that the higher harmonics each have points where the string amplitude is zero: there is no motion of the string at these points, which are called nodes. We could in principle put a finger on the string at those points, blocking its motion there, and not affect the harmonic mode at all; this technique is used in guitar playing and is known as a pinch harmonic. The waves themselves don’t move or change shape at all, except to move up or down; they essentially “stand in place.” Because of this, they are known as standing waves. This sort of mechanical resonance has had unexpected and devastating consequences in the past. As I’ve noted on my other blog, suspension bridges have been brought down when soldiers marched across them in formation, inadvertently driving the bridges at the resonance frequency until they collapsed. 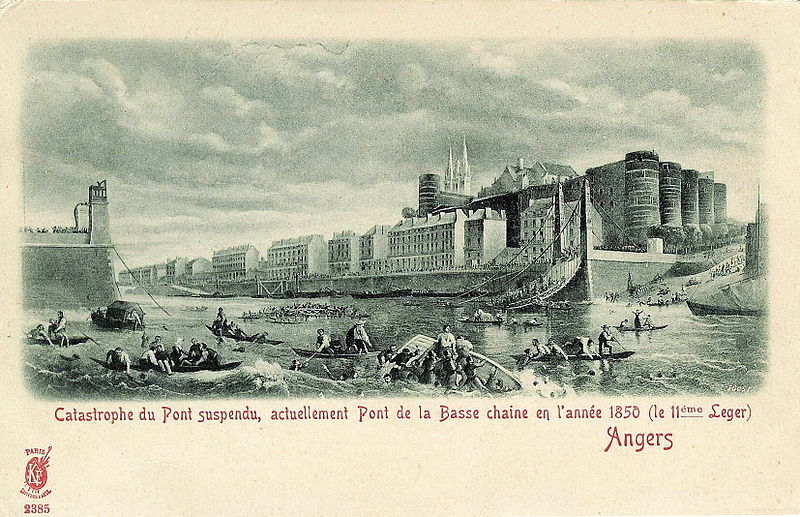 The most horrifying accident of this sort was the collapse of the Anger Bridge in France in 1850. A battalion of soldiers were crossing during a thunderstorm; although they knew not to march in formation, the swaying of the bridge caused them to unconsciously match its motion. 226 people were killed in the disaster. The collapse of the Angers Bridge, via Wikipedia. A string can only vibrate along its length; when we consider objects that have length and width, we can get correspondingly more complicated resonance phenomena. 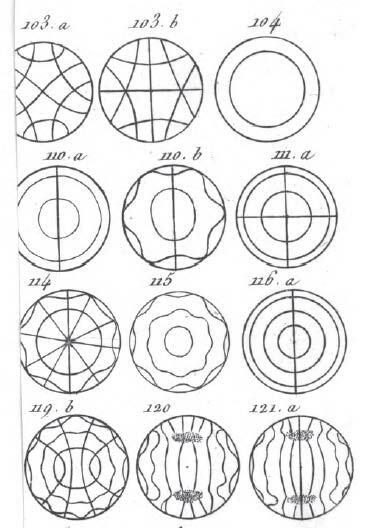 This was what German physicist Ernst Chladni (1756-1827) demonstrated using the clever technique that now bears his name. A rigid plate will have a set of natural resonance frequencies just like a string, and when the plate is excited at one of these frequencies, it will form a standing wave with fixed nodes. These nodes will form lines on the plate, in contrast to points on the string. Chladni realized that sand sprinkled on the top of the plate would be pushed away from the vibrating regions and settle into these nodes, allowing the node patterns to be seen. From William Henry Stone (1879) Elementary Lessons on Sound, via Wikipedia. 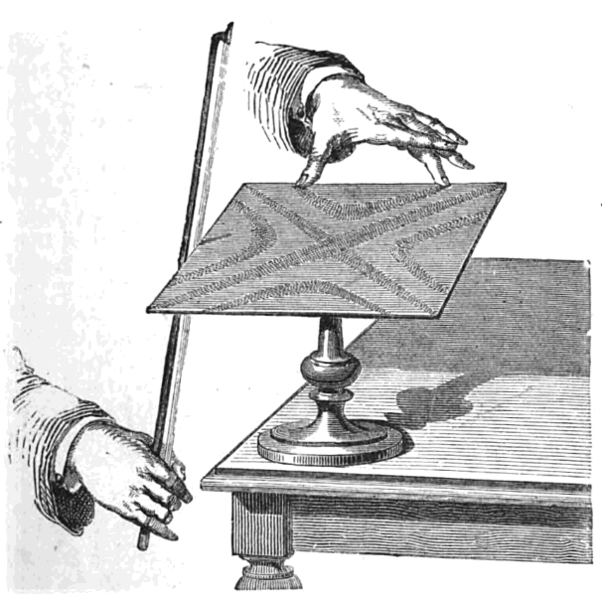 Chladni excited these resonant vibrations by drawing a violin bow across its edge, as shown above. Today, however, we can mechanically drive the plate from below with a mechanical driver — essentially a speaker hooked up to a frequency generator! I purchased a commercial mechanical driver and Chladni plate, but it is possible to build one yourself by cannibalizing a speaker. The patterns that result are beautiful, and increasingly complicated as the frequency is increased. Those patterns that I’ve found are shown in the slideshow below. Pattern 1, excited at 155 Hz. Pattern 2, excited at 467.5 Hz. Pattern 3, excited at 801.6 Hz. Pattern 4, Excited at 1146 Hz. Pattern 5, excited at 1893 Hz. Pattern 6, excited at 2250 Hz. Pattern 7, excited at 2473 Hz. Pattern 8, excited at 2593 Hz. Pattern 9, excited at 3258 Hz. Pattern 10, excited at 3965 Hz. Pattern 11, excited at 4350 Hz. Pattern 12, excited at 4930 Hz. Pattern 13, excited at 5281 Hz. Pattern 14, excited at 6197 Hz. Pattern 15, excited at 6690 Hz. Pattern 16, excited at 6800 Hz. 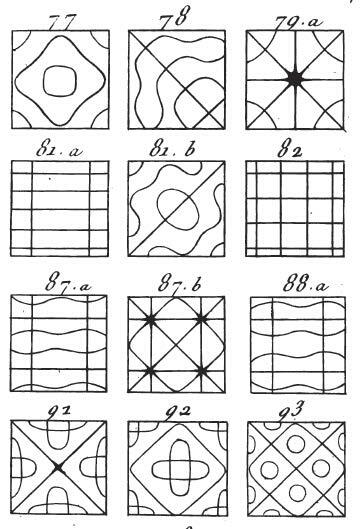 We can compare my patterns with those sketched by Chladni himself, in his 1809 book Traité d’Acoustique. Similarities between my modern version and Chladni’s can be readily seen. So can we learn from the existence of resonance vibrations, each occurring at a discrete isolated frequency? In fact, similar mathematics describes the energy levels of electrons in atoms and many other systems! The era of quantum mechanics really took off in 1913 when Niels Bohr speculated that the curious properties of light emitted by atoms was the result of electrons only being allowed to exist stably in certain specific, discrete, orbits, each with its own discrete energy. 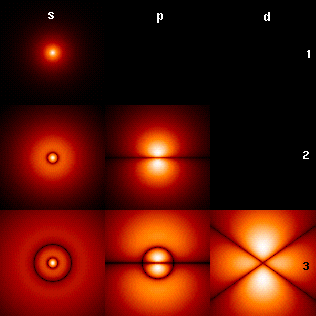 What Bohr could not explain is why electrons could only maintain these discrete orbits. This question was answered in 1924 when Louis de Broglie postulated that electrons themselves have wavelike properties. Just like waves on a string, then, an electron wave has certain natural modes of oscillation, and these are the stable states of the atom. Some of these probability waves are illustrated below, via Wikipedia. Laser cavities also demonstrate special modes of resonance. In a rectangular laser cavity, a laser can be induced to output one of multiple so-called Hermite-Gauss modes (named after the mathematical functions used to describe them). 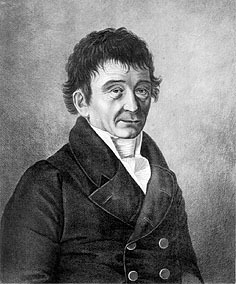 The first few Hermite-Gauss modes, via Wikipedia. These modes are a little different from those described earlier, as they are not distinguished by their energy (or frequency), but rather by their momentum. Nevertheless, the principle remains the same. 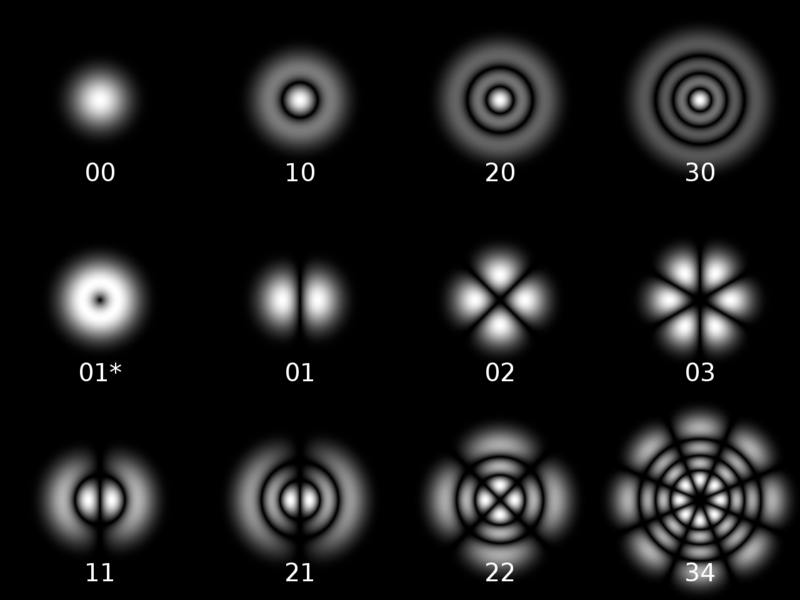 If one uses a circularly symmetric cavity, one can produce the so-called Laguerre-Gauss laser modes, some of which are shown below. 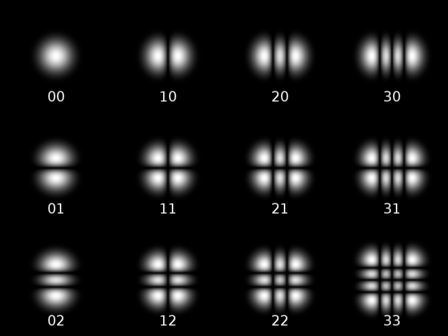 Some of the Laguerre-Gauss laser modes, via Wikipedia. If we use a circular Chladni plate, we can also get a new set of patterns, as Chladni himself demonstrated in his book. These patterns are strikingly similar to those of a circular laser cavity. So by studying the vibrations of a metal plate, we can gain insight into everything from light to atoms! 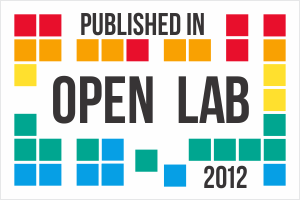 Not a bad outcome from an experiment that was first done in the early 1800s! Update: I thought I’d mention the specific tools I used for my Chladni setup, as following the “official” requirements through an online science store can be expensive! I ordered a vibration generator and Chladni plate from DrMass.com for about $250. Instead of purchasing a very expensive signal generator to drive the system, I purchased a stereo receiver from Radio Shack for $100. To generate the frequencies, I downloaded a free tone generator app to my iPhone! All told, I spent quite a bit of money to get my system running, though as I noted above it is possible to build your own driver for much cheaper. This entry was posted in Physics, Physics demos. Bookmark the permalink. This is in interesting blog post and somewhat into my field of energy and flower essence healing! Thank you to the post author for this. 🙂 Out of the lab, but still a geek! Just in case folks miss the connection, it’s worth noting that the one-dimensional case you initially discuss also applies to laser cavities! Only certain frequencies are supported by the length of the laser cavity, and that means that the laser can only emit light that corresponds to those wavelengths. That’s the key reason why laser light is often treated as effectively monochromatic. I think I’ll still this demonstration for my lasers students next year, unless I come up with a direct way to generate different TEM modes in a laser! Very true! I mentioned the transverse laser modes, because they’re easier to visualize, but the longitudinal laser modes satisfy essentially the same “waves on a string” mathematics. What do the numbers over the Chladni figures mean?